What a position for stone circle! After a long, steep climb you come upon the Druid’s Circle way above the town of Penmaenmawr on the North Wales coast. To the east is Conwy, to the west is Bangor and Anglesey. 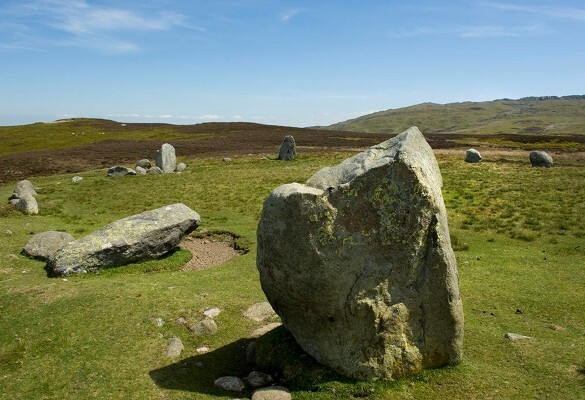 The circle is situated close to a pre-historic trackway and estimates say it was built around 3000BC, only acquiring its English name in the 19th century. There are around thirty stones, eleven still standing, set on the edge of a low embankment 35m in diameter. Excavations in 1957 found the cremated remains of a child and a food vessel. One of the stones has a ledge in the top (the so called Stone of Sacrifice) and it is said that placing a new born baby here will bring it much good luck. Like so many of these sites the surrounding area is full of megalithic features and the Megalithic Portal has good maps showing other interesting locations including the Maen y Bard (the Stone of the Bard) prehistoric site two miles away. Two further interesting facts. Nearby was one of the most important stone axe manufacturing sites in Europe (together with Langdale in the Lake District) and from August 18 – September 1st 1923 Rudolf Steiner held a summer school in Penmaenmawr with the Anthroposophical Society. On the final day he said, ‘A great and wonderful opportunity has been given for this to happen here in Penmaenmawr, for we have been living here as though in an atmosphere from which wonderful things radiated in the ancient sanctuaries. The choice of the place was most fortunate. We can truly say that in the wonderful solitude up there, where those stone circles stand, one is still met by the real echoes of what once worked with such strong power in these mother regions of Europe. In a sense the profound Mystery knowledge that was once sought in these holy sanctuaries has gradually passed into cosmic memories, which hover like luminous clouds in the hollows of the hilltops among which these holy relics are enshrined.’ (‘Rudolf Steiner Speaks to the British’ Rudolf Steiner Press 1998). Location: Take the old A55 road through the centre of Penmaenmawr, and, if arriving from the Chester direction, turn left at the traffic lights in the village centre. The car park is almost immediately on your right. Turn right out of the car park, then immediately right again (Y Berllan).